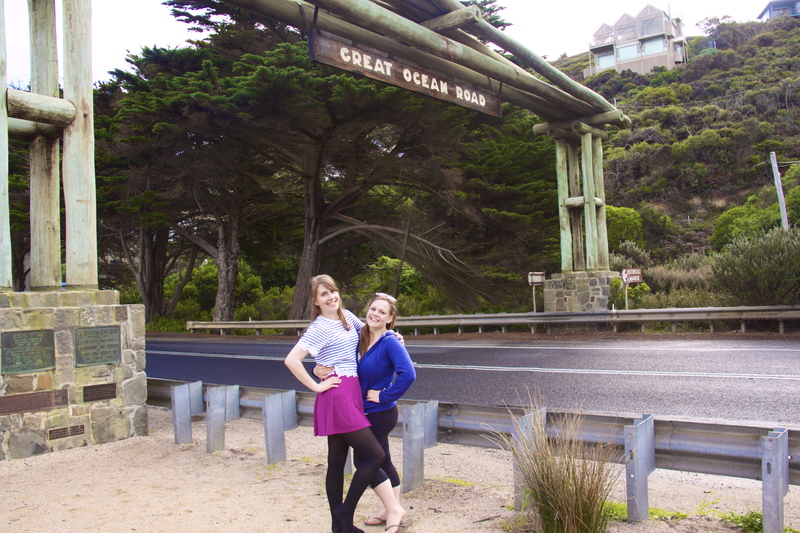 Last Tuesday, Cheyenne and I started our mini-road trip from Melbourne to Adelaide via the Great Ocean Road. We rented our car at the Avis near Southern Cross Station on Tuesday morning, aiming to get to Apollo Bay by that evening. 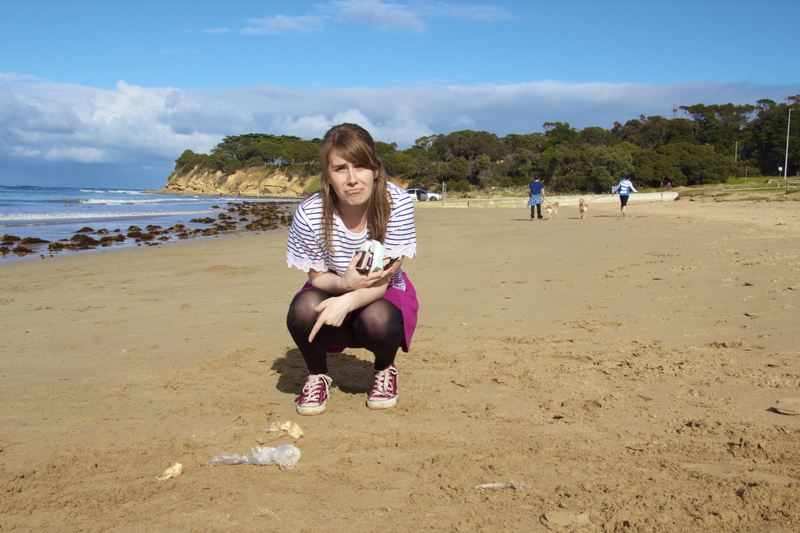 We started out at 10 am with some packed lunches, and got to our first stop-off at Torquay Beach around 11:30. The beach itself is easy to get to, wide-open, pet-friendly and generally very well kept. 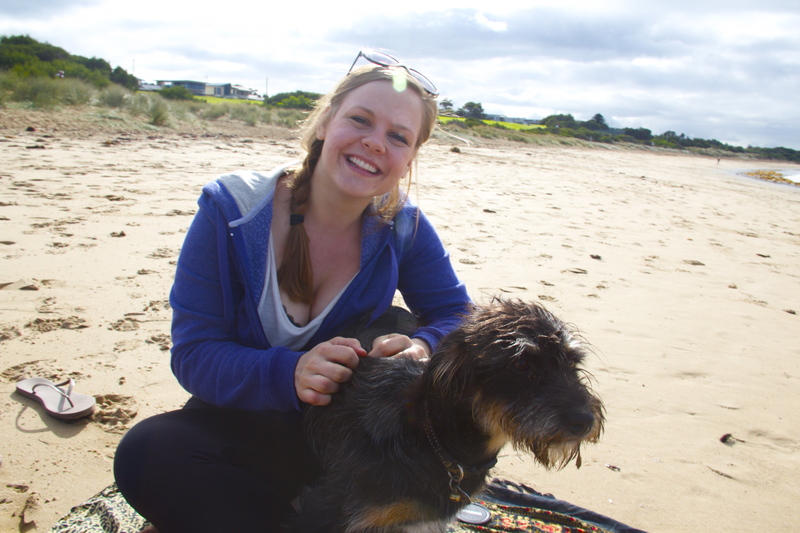 We were lucky enough to get a little bit of sunshine while we ate, but unfortunately the pet-friendliness of the beach ended up with Cheyenne losing some of her lunch, as a cheeky yellow lab snagged most of her Foccacia while we had our backs turned. After a little more play time on the beach, we set back out on the road and drove for another five hours. The scenery was breathtaking and we found ourselves stopping all the time for photo-ops, and the views just kept getting better and better! 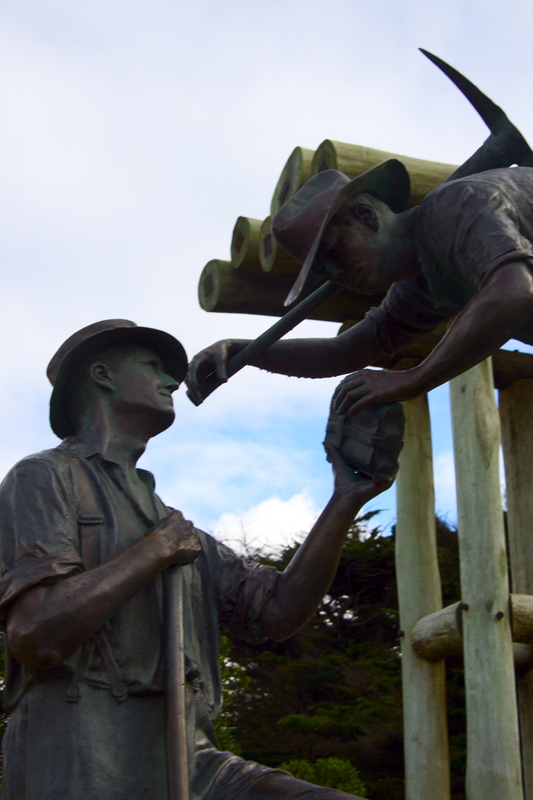 We spent a good deal of time at the Great Ocean Road memorial arch, which also had a small military commemoration and was generally a nice place to have a rest for a few minutes. Along the way we noticed that Australia is particularly fond of aggressive road signage and polarizing place-names, with signs including friendly warnings (“drowsy drivers die,” “survive this drive,” and “fatigue is fatal” were three of my personal favorites), and with places of interest called things “Shrapnel Gulley” and “Mt. Defiance.” Our first day of driving lasted about five hours, and we arrived at our hostel around 3 pm. 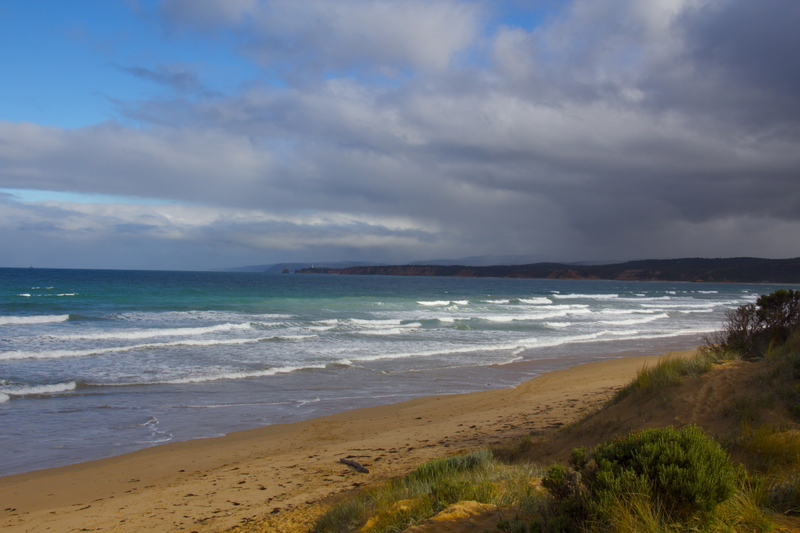 We ended the night in Apollo Bay, a quiet little beachfront town with an amazing youth hostel. We stayed at the Apollo Bay Eco YHA, which was more like a dorm-style hotel than a hostel and had very friendly owners, an amazingly homey living room, and a big, bright, functional kitchen. It was a five or so minute walk from the nearest grocery store and a five minute walk from the beach, and was overall an amazing place to stay. Cheyenne and I had a bit of a late start on the second day of our trip, getting out around 10:30 am. 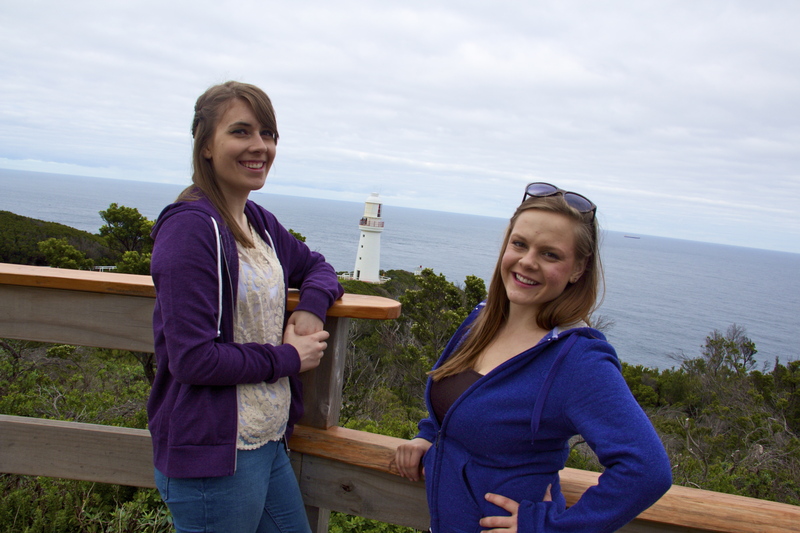 Our first stop was the Cape Otway Lighthouse, which was scenic and had some great grounds to walk around. 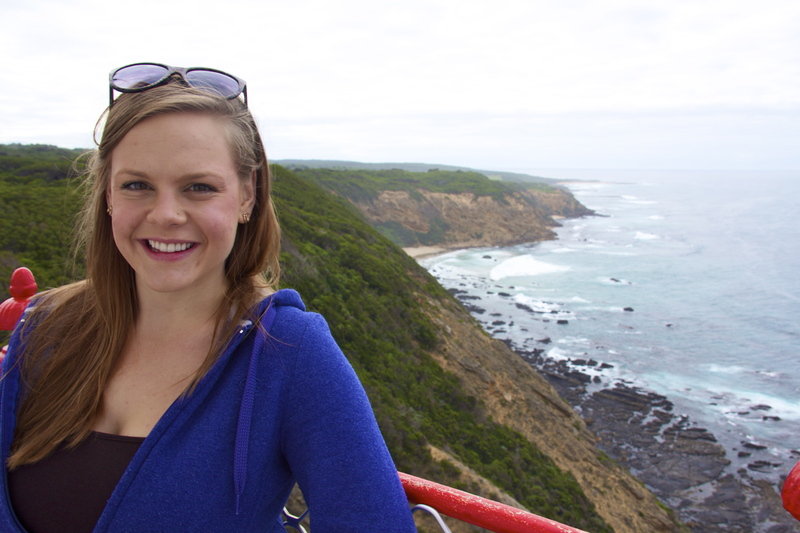 Entry to the Cape Otway area was $19.50, and included entry to the park, to an aboriginal museum, to a museum devoted to dinosaur fossils, and to the lighthouse. The lighthouse had a friendly and knowledgeable tour guide on top, eager to answer any questions we might have had about the area. The view from the top of the lighthouse was equally great, and in the right season makes for a great whale-watching location. 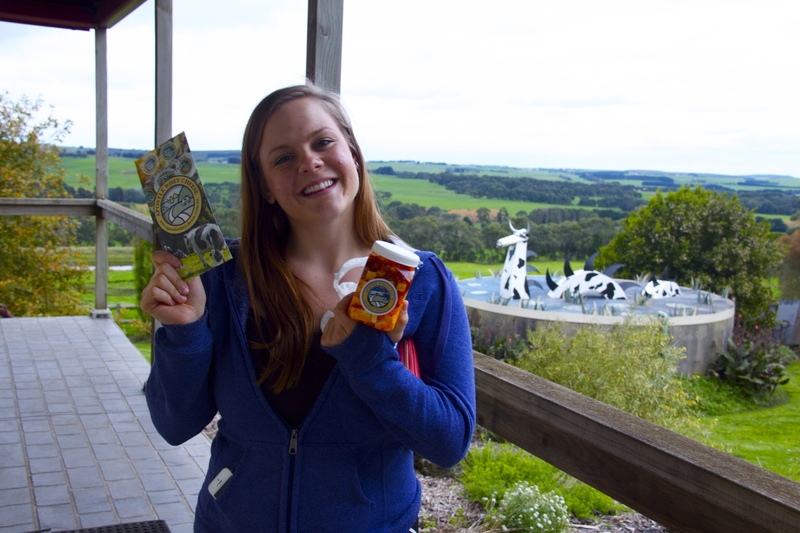 We had some soup at Cape Otway’s café, which was expensive but perfect for the chilly day, and the café couldn’t have been in a more scenic spot. 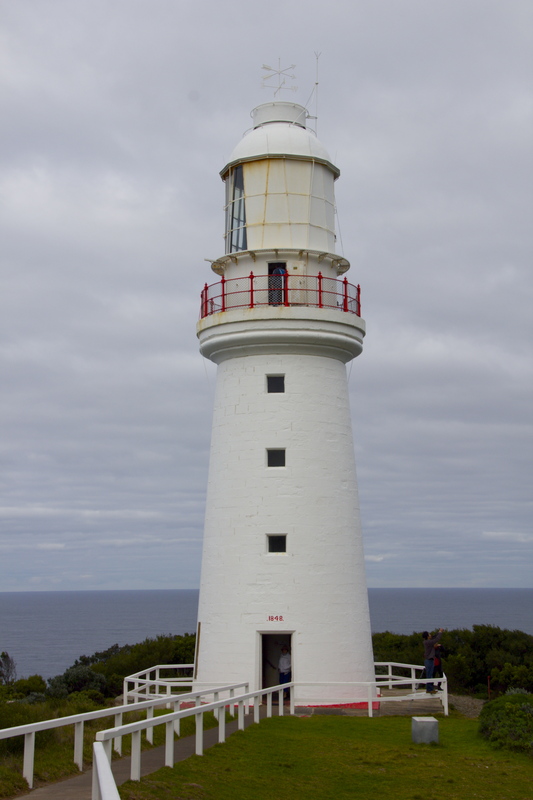 As we ate we heard some of the history of the lighthouse and the cape, and learned that it was the port through which many immigrant Australians came from 1848 onward. After we finished lunch we started driving again, moving slightly further away from the ocean for a few dozen kilometers as we drove through densely tree’d areas. The roads were windy but felt pretty safe, and the scenery was absolutely gorgeous. 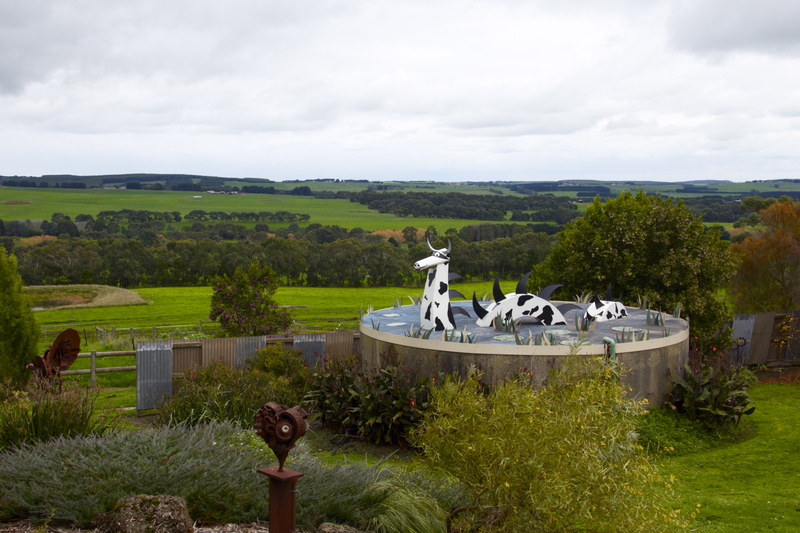 After an hour or two of driving we entered into wine and farming country, and we made a few pit stops along the way. 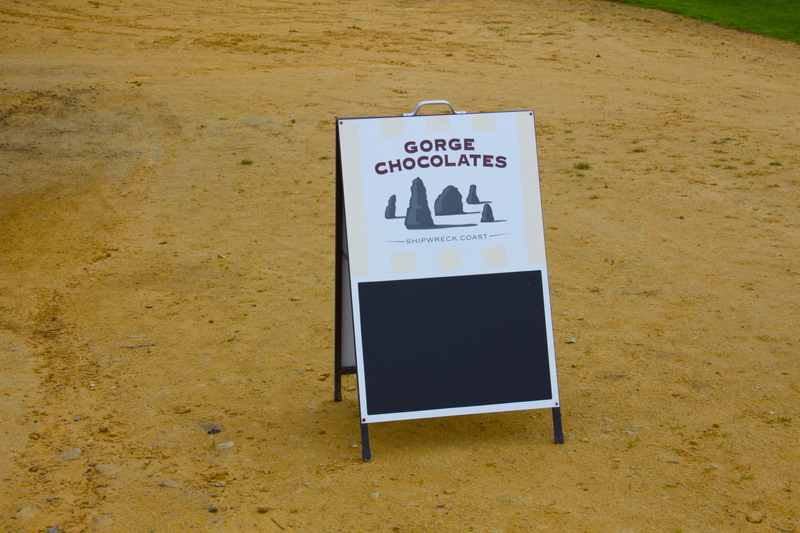 Our first pit stop was the G.O.R.G.E chocolate makers, which offered some free samples and chocolates that came in a variety of different flavors, shapes and sizes. The chocolates themselves are tasty and not particularly expensive; I bought a large milk chocolate bar, a pair of chocolate frogs, a chocolate koala and kangaroo set, and a large chocolate “freckle” (chocolate topped with colorful sprinkles) for $13.50. 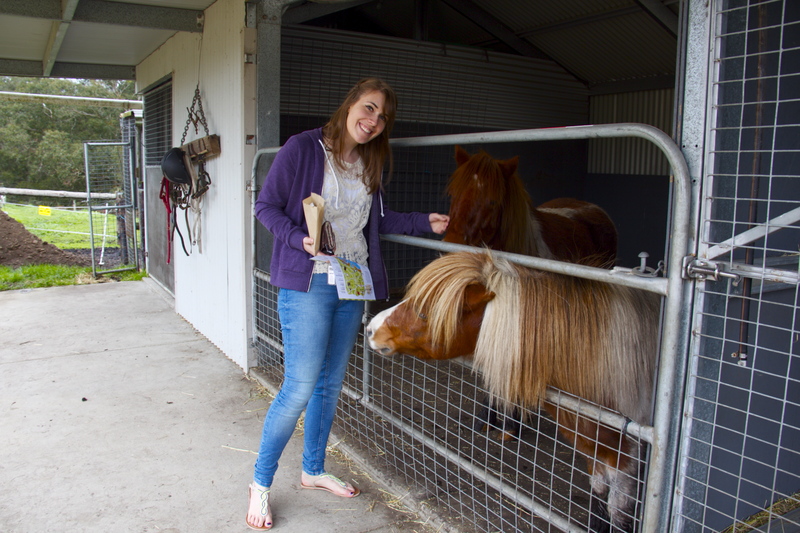 The G.O.R.G.E chocolatiers also had two resident miniature horses who were super cute and friendly! 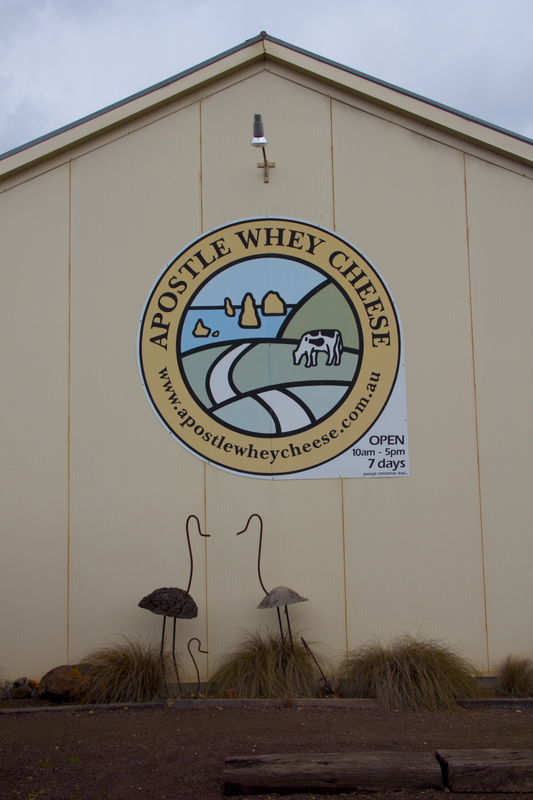 A few kilometers up the road was the Artisanal Whet Cheese makers, whose farm and cheese making facilities are located in the middle of the gorgeous countryside. 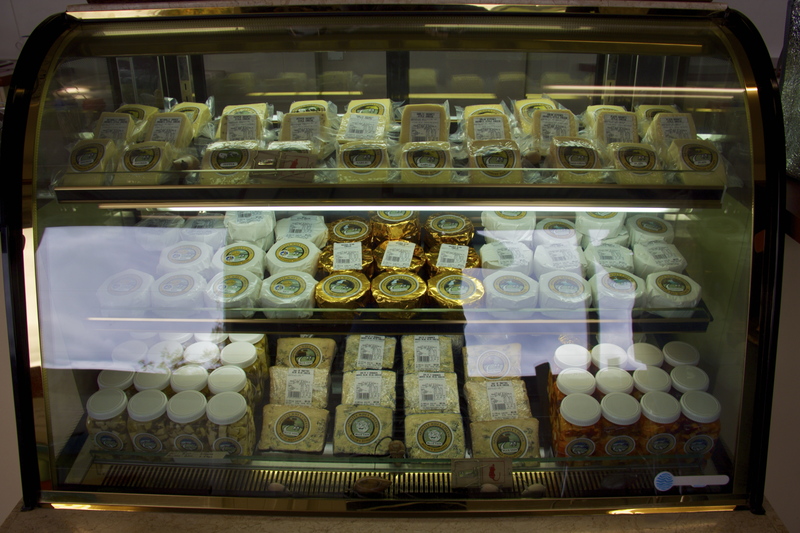 They offered a free cheese tasting with a selection of 9-11 cheeses, all made on site. 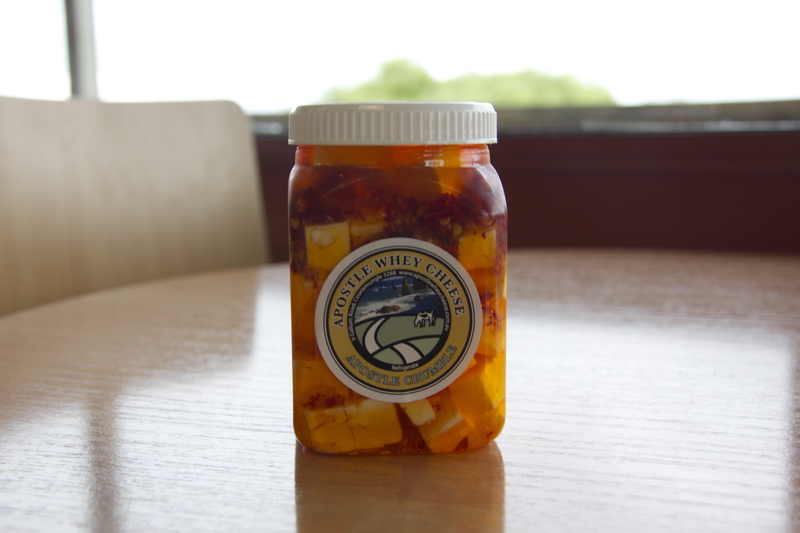 I can’t say there was a single cheese that I tried that I didn’t like, but I absolutely loved their chili and garlic marinated feta! I bought a box of it for $10, which was definitely more than worth it. 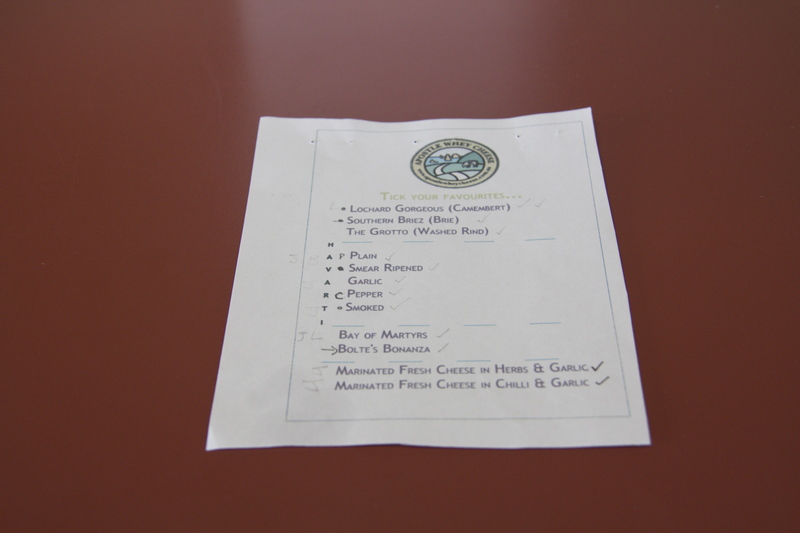 Unfortunately, I was unable to try the blue cheeses they had on offer as I’m allergic to penicillin and I’m gluten intolerant, but I have it on good authority that they were also pretty tasty! Our last stop on our mini foodie tour was one of the vineyards another few kilometers up the road, but unfortunately they were closed when we got there. 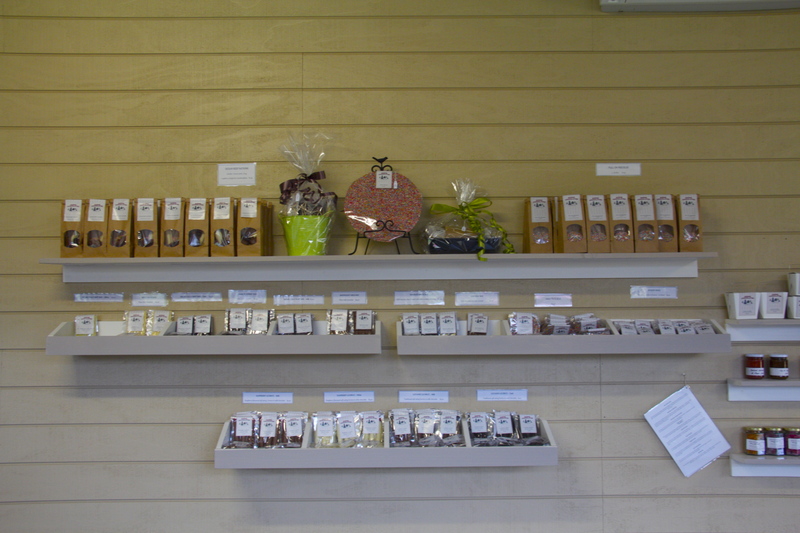 Thankfully we were 100% satisfied with our chocolate and cheese, so we weren’t too disappointed! 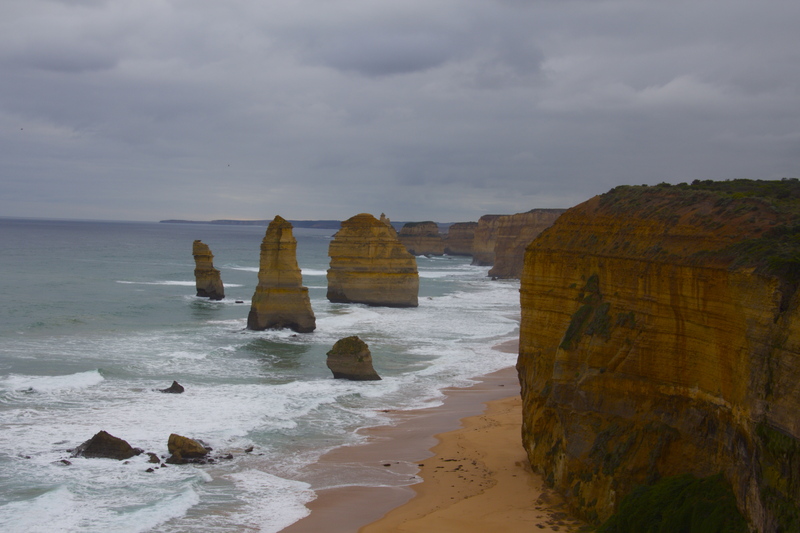 Our next stop on the road was the 12 Apostles, which are probably the most famous landmark on the entire trek. 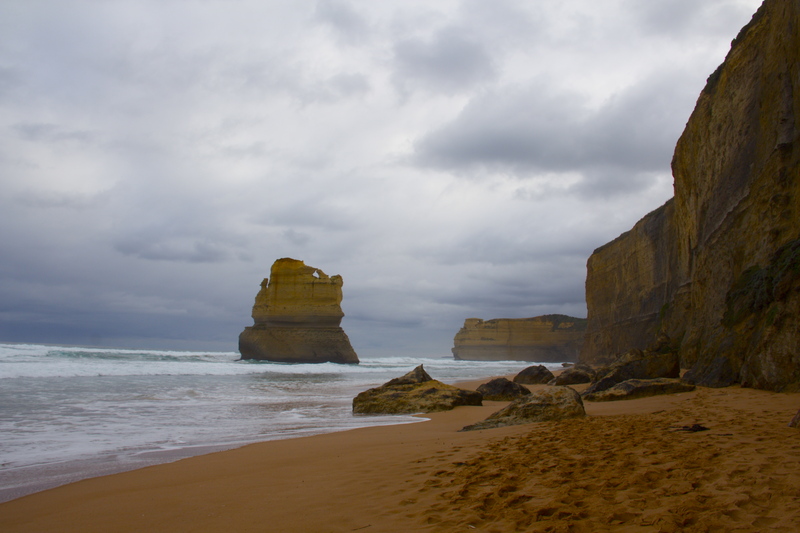 Day tours will take you directly there from Melbourne, and the area itself was pretty crowded with throngs of tourists. There’s a nice beach before the apostles that I think I liked even better than the apostles themselves, as it was quiet but very scenic and not super well-touristed. 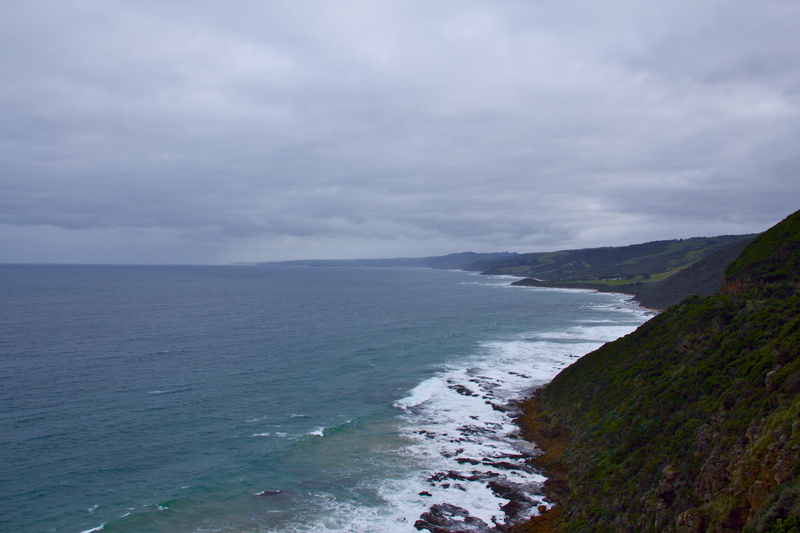 The weather was pretty volatile during our drive, though, and the waves were way bigger than I had expected. As a result, I had to change my skirt when we got back up to the car, having been hit unexpectedly by the renegade tide and been soaked up past my knees. We traveled the next 200 or so kilometers to Mt. 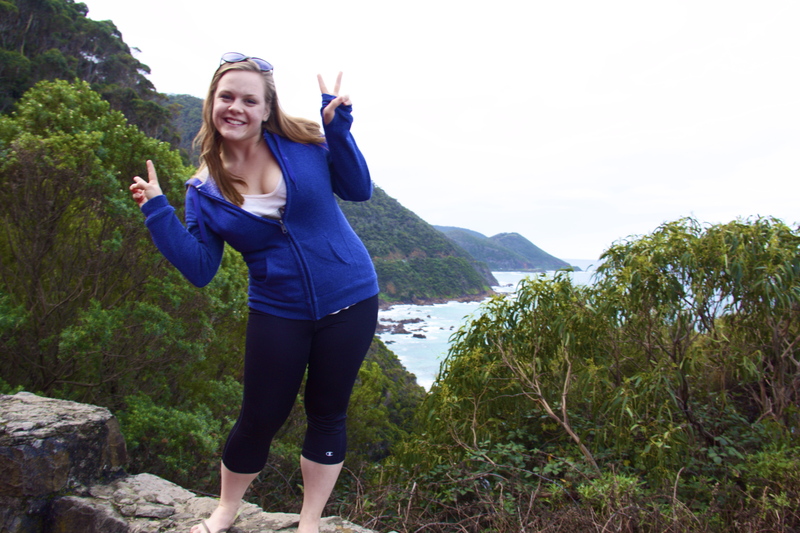 Gambier without many stops, and stayed the night at the Mt. Gambier Gaol Hostel, which used to be used as a prison and a halfway house. The hostel was undergoing renovations, but thankfully the woman who runs the place accommodated us anyway, and we had an awesome (but kind of creepy) night, even though we were the only guests there. 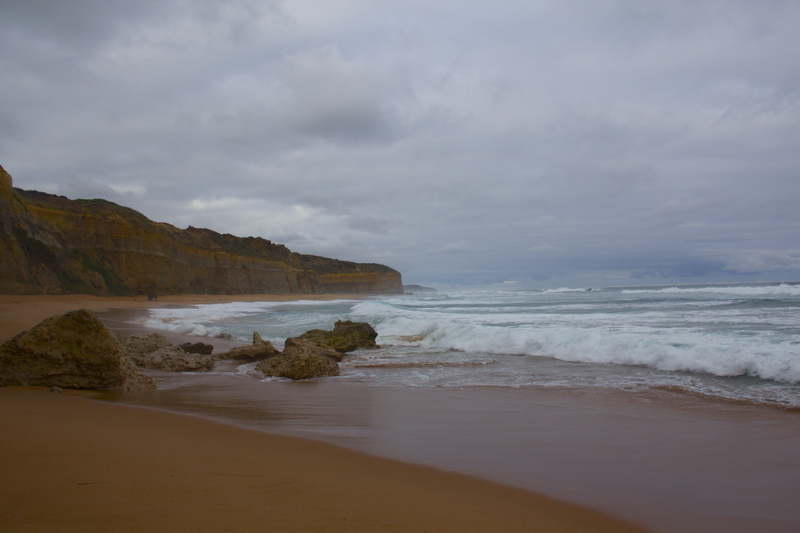 The next day we drove another five-ish hours off the Great Ocean Road until we got to Adelaide. This leg of the journey definitely wasn’t as scenic, but was a nice drive all the same. 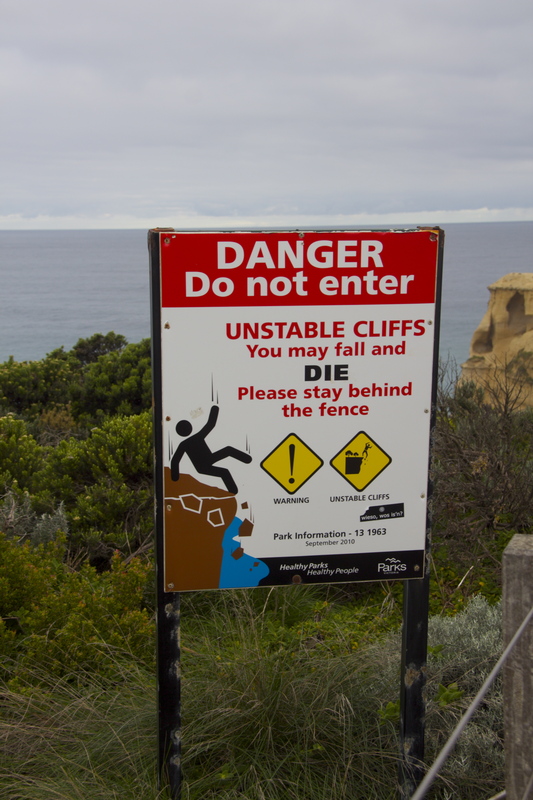 If you ever get the chance to do the Great Ocean Road I’d definitely recommend it, but unless you’re super pressed for time, stay clear of the tours! Its way more rewarding (and probably cheaper) to do it on your own. I think that the miniature horses might have been Shetland ponies. Wonderful post! The scenery was beautiful.